A Hesped for Rav Treger - as the Rosh Yeshiva of Eitz Chayim, Wilrijk, near Antwerp in Belgium was known - was held on Monday evening 21 Sivan at the Pardes Wiznitz hall on Lampard Grove, North London. The event was attended by his many Talmidim, some whose grandchildren are now of Yeshiva age and many who only knew the Rosh Yeshiva from his many Shiurim that he delivered in Antwerp proper, having settled there in his later years. 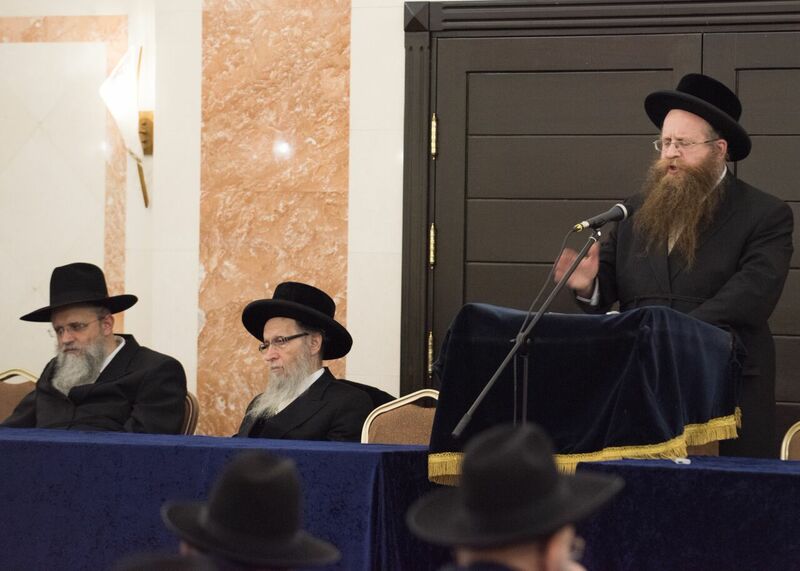 Listening with rapt attention . . . .
Wilrijk old-timers, who left the Jeschiwa (=Yeshiva) many decades ago sat alongside Yungeleit and listened as one eulogy after another highlighted the sterling characters that this Godol beTorah demonstrated throughout his very productive life. Also in attendance was Dayan HaRav Yosef Padwa Shlita, whose sons attended Wilrijk Yeshiwa under Rav Treger Ztz"l.
Following Minchah, the chairman Rabbi Moshe Halevi Hoffman opened the evening by describing his own feelings of loss, reminiscing on the many tranquil, learning filled years that he spent under the Rosh Yeshiva's tutelage. He echoed the sentiments of many, when he described the electrified air that permeated the Yeshiva walls, as if charged with Torah-power. Rabbi Moshe Hoffman then introduced the guest speaker Rabbi Eli Aftergut who came specially from Antwerp to be Maspid his mentor, emphasising the many facets by which the Rosh yeshiva was uniquely famous: his breadth and depth of analysis, his concentration power and how he moulded each and every Talmid into a Ben Torah. He made us aspire to greatness and opened up vistas of learning that enabled us - his Talmidim, whom him dearly loved - to blossom in their adult years, long after they left the Yeshiva. Rabbi Moshe Hoffman then introduced Rabbi Sholom Tzvi Englander, who kept the audience spellbound with his description of the Rosh Yeshiva's pedagogic prowess, retelling a number of anecdotes to illustrate this rare quality, for which our generation of Mechanchim is sometimes left wanting. The Rosh Yeshiva invested much thought into how to present a novel idea of Mussar and Hashkofo, so that even the most recent arrival should be able to absorb it. Rabbi Moshe Hoffman then introduced the youngest son of the Rosh Yeshiva, Harav Yitzchok Treger of Har Nof, Yerusholayim, author of Halichos Shlomo and other Seforim. Reb Yitzchok dwelled on the manner in which his great father the giant in learning who delved into the depths of the most intricate Sugyos of Shas, managed to explain his Shiurim to the young saplings that were under charge and how a variety of Torah movements and worldviews found a place in his large heart, by which he managed to unify such a diverse collection of Bochurim, many who were poles apart from each other - into a cohesive and happy Chaburah. His early Chasidic upbringing was augmented by the Lithuanian Derech HaLimmud in his formative years and found meaning after his wedding to the daughter of Rabbi Shlomo Zalman Auerbach Ztz"l, who was the epitome of Halocho in his days. With his typical warmth and natural way with people, coupled with his trademark humility, afforded him a route straight into the hearts and minds of his pupils, many of whom regard him as their life mentor - as was evident at this gathering. The Talmidim agreed to perpetuate his memory in a Torah Way: using the end of the twelve-month period as a goal, the whole Shas (Gemorro Bavli) will be completed by dividing it into 30-folio portions each - לעלוי נשמת מורנו הרב י-הודה ארי-ה בן ר' אברהם. The Siyum is planned for the 27th of Adar II 5776, when a dinner is to be held in London in memory of Rav Treger and in support of the Wilrijk Yeshiva. For more details, contact 07974160252. The organisers wish to extend their heartfelt thanks to Mr Gershon Leitner and his able team, who laboured unflinchingly to guarantee the success of this auspicious event. The large turnout surely is credited to his effort, for which we wish him success in all his private as well as communal endeavours.